One of the main prizes celebrated at the Heidelberg Laureate Forum each year is the Abel Prize – established on 1 January 2002, the Abel Prize recognises outstanding scientific work in the field of mathematics, and has given a prize of 6 million NOK (about €750,000) to one or more outstanding mathematicians ever year since 2003. This year, for the first time ever, the prize was awarded to a woman. So who is Karen Uhlenbeck, and what kind of mathematics does she do? Karen Keskulla Uhlenbeck was born in 1942 in Cleveland Ohio, and received her B.A. in 1964 from the University of Michigan. She went on to study for an MA and PhD at Brandeis University in Waltham, Massachusetts, and thereafter worked at a range of other institutions, including University of Texas at Austin where she is now an emeritus professor. Uhlenbeck’s work concerns the calculus of variations – studying functions, and how they behave, by finding their minima and maxima – changing the input value a small amount to see what happens to the output. It can be used to find the shortest path between two points when constrained to the surface of an object, or the shape a cable will make if left to hang, as well as problems concerning elasticity, solid and fluid mechanics, electromagnetism and gravitation. Calculus is particularly useful when considering and modelling physical systems, and Uhlenbeck worked in the crossover between calculus and geometry. Geometric analysis connects differential geometry – studying 3D shapes and surfaces by considering the functions that define them – with differential equations. 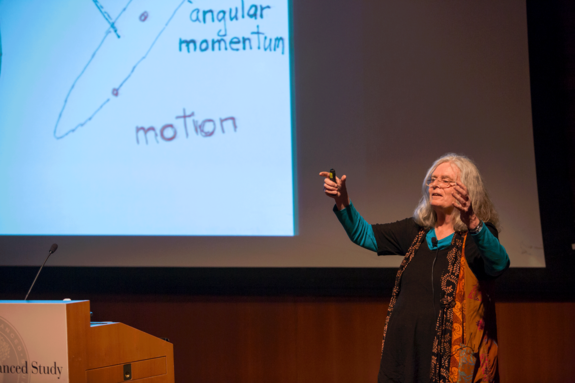 It was founded by Uhlenbeck and her collaborators in the early 1980s, when they published a paper on minimal surfaces, setting out tools and ideas that became the foundation of the topic. A minimal surface is one in which the surface area is minimal given the constraints. A nice example of a minimal surface is given by soap bubbles. 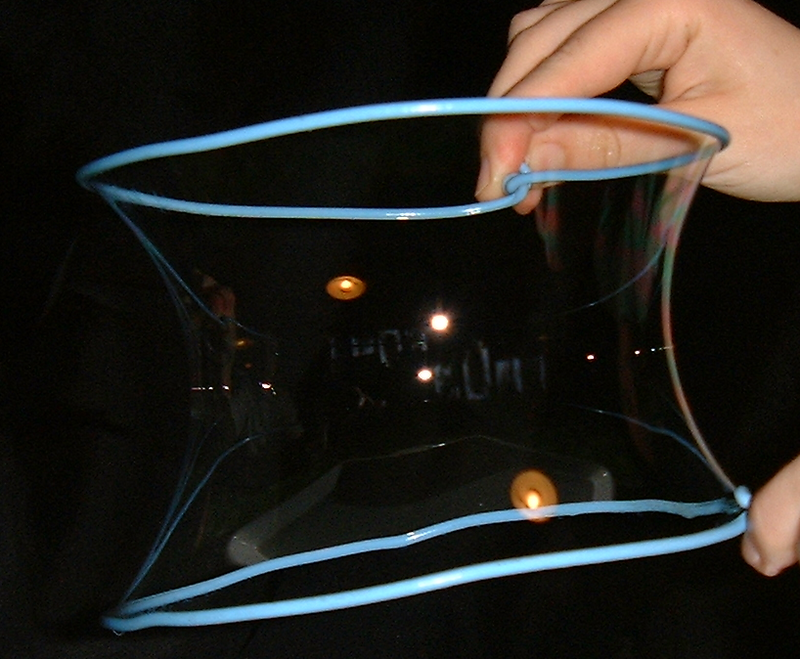 In the absence of any constraints, bubbles will naturally form a spherical shape – one with minimal surface area – but if the bubble is attached to a surface, or a wire, the minimal surface can look different. Depending on the situation, it can be quite hard to mathematically describe what such a surface looks like, and Uhlenbeck’s work included ways to deal with singularities (non-smooth points) on such surfaces. Karen’s initial major was in physics, and her work often crosses over between maths and physics. After hearing a talk by fellow Abel prize winner and HLF regular, the late Sir Michael Atiyah, Uhlenbeck became interested in gauge theory – the study of forces such as electromagnetic charge, by making changes to related variables and observing (gauging) the result. Some of Uhlenbeck’s most noted work has been on this topic, and laid the groundwork for some of the most exciting ideas in modern physics. In her life, Karen Uhlenbeck has made huge contributions to many areas of maths and physics, and has been recognised for her work with many awards – the latest of which is her Abel prize. As well as the 2007 Steele Prize for a Seminal Contribution to Research, she has been awarded a MacArthur Fellowship in 1983, and the National Medal of Science in 2000. She was elected to the U.S. National Academy of Sciences in 1986 and to the American Philosophical Society in 2012. Uhlenbeck is keen to pass on her love of mathematics through outreach. As part of her work as a visiting senior research scholar at the Institute for Advanced Study in Princeton, she has co-founded the Park City Mathematics Institute, a three-week residential summer conference held in Utah for students, researchers and maths teachers, as well as being involved in the IAS’s Women and Mathematics Program. She also gave the plenary lecture at the International Congress of Mathematicians in Kyoto in 1990, on Applications of Non-Linear Analysis in Topology. The only other ICM plenary given by a female mathematician was in 1932, when it was given by Emmy Noether (who I wrote about back in February). It’s a sad state of affairs that in the ICM’s entire history, only two women have ever been their plenary speaker, but it’s not a surprise given how few women are included in the higher ranks of mathematics. While Uhlenbeck was considering where to study for her MA and PhD, she deliberately chose against prestigious schools such as Harvard, as she knew the competition there would be fierce, and this illustrates one of the many barriers women face in mathematics. Karen Uhlenbeck has created a wonderful legacy of mathematics, as well as being a strong advocate and role model promoting greater gender diversity in mathematics and in science. Maybe given time we’ll see more female ICM speakers, and the world will have more fantastic mathematicians like Karen Uhlenbeck. Citation: Uhlenbeck deliberately chose against prestigious schools such as Harvard, as she knew the competition there would be fierce, and this illustrates one of the many barriers women face in mathematics. There are not only barriers but also many preconceptions regarding an university or a field of study. My physics teacher told us, that he has chosen physics because mathematics seemed to him to strange and even stranger seemed to him the students of mathematics. Girls face the general preconception, that their natural interest lies in things related to health, education, society and humans in general. There would certainly be more female mathematics students if these preconceptions would vanish.